daunting responsibility. She must protect the stone of Muuk’Ich while Sarian, the underworld general, relentlessly drives her to the brink of insanity. Hell hath no fury like a woman scorned—but when that woman has no soul and a taste for revenge, they will need the powers of every surviving ancestor simply to stay alive. 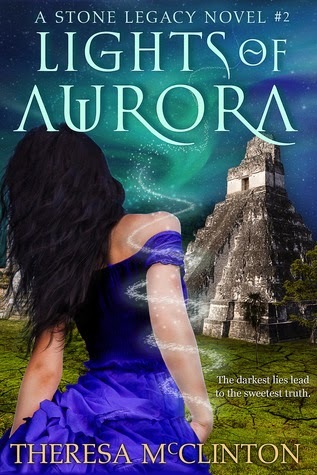 Buy Lights of Aurora for 99 cents!! The air continued to chill as they traveled deeper into the caves. A narrow passage they had been following finally opened into a grand cavern. Stalactites hung from the roof of the chamber giving off an eerie amber glow, and the angles of each formation guided droplets of moisture to their points until they slipped to the stone ground, filling the space with soft patters and drips. In the corner sat a stone altar. Ashley crept toward it with cautious steps over the slick ground. As she drew closer, the light in her chest allowed her to better see the slab. Her heart dropped. It was a sacrificial altar, a small stack of bones piled on either side. They could only belong to a child. He slipped his hand around hers, reassuring her with his touch. “I know.” They paused side by side in a mutual moment of silence for the tiny victims. How anyone could kill children was beyond her. Carved markings protruded from the face of the stone. Ashley stooped to see them clearly, as they were dusty and discolored with age. She brushed her fingers over the symbols, which were all generally the same shape. But each carving seemed to represent a word, like the logograms she learned about in ancient history class in the orphanage. He stood and stared down at the stone surface. “Blood analysis isn’t as new as science likes to believe.” He rested his hands on the curved edge of the sacrificial bowl. Ashley rose and watched him drag his fingers over the rim of the bowl before he paused over a sharpened edge. She hadn’t noticed, but one edge was ground into a blade-like arch, still darkened with the stain of blood from the last sacrifice. Bile churned in her stomach. Everything about this was wrong. The feeling of the cave, the weird glowing stalactites hanging from the ceiling, the altar, and the bones. The metallic stink of blood still hung in the air. She couldn’t stand being near the remains for another second. Not when the faces of the innocent children rose through the folds of her imagination. Their tiny bodies must have struggled while grown men forced them to lie down, knowing what was about to happen. She read once that being offered as a sacrifice was an honor, and often women and children were given messages to deliver to the gods before they were killed. A shiver ran down the back of her arms. What a horrible, unnecessary way to die. “This is the portal.” Arwan said quietly. Ashley studied him while he stood perfectly still, focused at the bloodstained altar. He turned to face her, his gaze piercing, intense, and unsettling. “Tell me you’ll always want me.” His words came out in a soft plea. “What?” She shifted her weight. His grip tightened over the stone bowl. “Please, just tell me that after this, you’ll still want me.” His eyebrows arched, as did the panic that tore through her. Before she could reply, Arwan pressed his wrist against the bowl and slid it across the sharpened rim. His skin tore open, and his blood began to flow. To learn more about Theresa McClinton and her books, visit her website.You can also find her on Facebook & Twitter. Thanks for dropping in, Annie! I'm glad it looks like a good read to you. 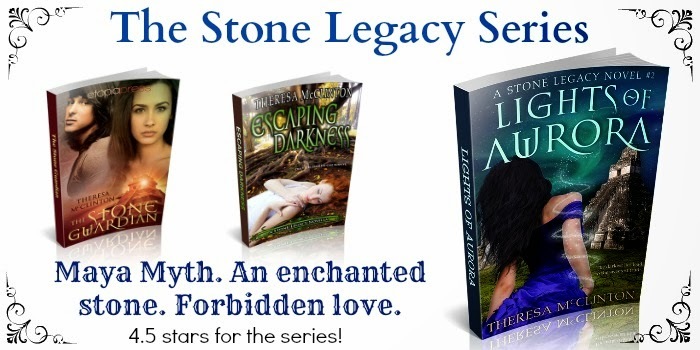 I've had so much awesome feedback about the series. It's overwhelming sometimes! And as always, I LOVE being on Whats Beyond Forks. Thanks again for having me!